Could someone do for me BIOS modification derived from ASUS laptop K93SM? BIOS provides support for Sandy Bridge i7-2670QM processor with HD3000. What I mean is to also provide support for I7-3610QM processor with HD4000. I also request you to update vbios. I know that the new processor might not work but I would like to try. I know that HM65 chipset supports i7-3610QE processor, so it should work with I7-3610QM as that models are identical, except that one is Embedded. Please accept, that I will not help you. This Forum offers guides and support for users, who want to modify the BIOS of their system themselves, but not already modded BIOSes upon request. But I need help with modifications. I mange to extract CPU microcode from bios from another Asus laptop that supports i7-3610qm and I inserted that microcode (MicroCode ID 0126A915, CPU ID 06A9) to the bios that I attached in first post using mmtool. Modded bios attached. I also made modification using amibcp to unhide some things in bios and I also made mod for iGPU giving higher values for aperutre size (from 256MB to 512 MB), DVMT Pre-Allocated (from 64M to 512M) and DVMT Total Gfx Memory (from 256M to MAX). Now what should I do next, vbios update? How to do it step by step? Could you provide me vbios file that supports both sandy and ivy hd graphics for next step? The Intel VGA ROM v2170 supports SandyBridge and IvyBridge CPUs. You can find the related Option ROM within the start post of >this< thread. So, what should I do next. Could you tell me how to update vbios using this .bin file? Your mainboard BIOS is an AMI Aptio UEFI v4 one. The easiest and safest way to modify any module of your mainboard BIOS is to let the UBU Tool do it. I used UBU tool, but nothing has changed. I selected number 2 then i select number 1 to update to v2170 but after that it still shows v2104 in bios. I also tried to put the file you provieded to modules/vga folder but still the same. No change to vbios version. I am not sure abvout that and suspect a space problem, because your UEFI BIOS has just a size of 2 MB. Maybe it will help, when you remove the original Intel VGA ROM as first step, then save the modded BIOS and at least insert the new Intel VGA ROM. Important warning: It may be very risky to update the Intel VGA ROM of a mobile system. Okay, I managed to replace vbios using mmtool5 to v2170. Now I have question whether I should add in mmtool5 Intel HD 4000 by the insert option and enter the appropriate Vendor ID (8086) and Device ID (0166) or leave it as it is now. I attached modded bios. Could you check it and compare it with the original bios from my first post. If you continue what you are doing you will brick your laptop. Intel vBIOS has a mobile and a desktop firmware. UBU includes the desktop counterpart only and that's why it won't allow you to replace your current one. You need to find the mobile 2170 vBIOS and modify it with Intel BMP first (SoniX has a "repository" link somewhere for both firmware and BMP Tool) otherwise there will be issues with video/audio sources, outputs etc. Don't use MMTool5 to modify an Aptio IV platform. Use MMTool4 instead. Don't use UBU for a laptop unless you know what to do and what not. In this case only RST, PXE and Microcode can be updated via this utility. Nothing else. Cpu microcode was updated using mmtool4. 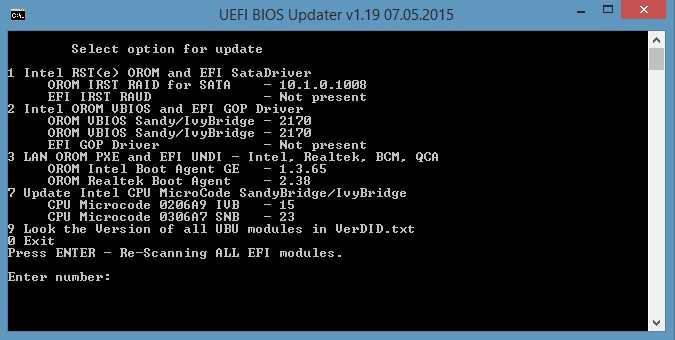 I didn't update anything with UBU, I only check if Vbios was being updated. I use mmtool5 by mistake to replace vbios. I will replace Vbios using mmtool4, and the vbios that i replaced with mmtool was 2170 mobile from SoniX repository. But as I said, maybe the 2104 vbios works with Ivy GPU, can you cheack this? But i have no idea how to use BMP tool and what to do in this program. I was thinking that replacing bios in mmtool4 with 2170 mobile is ok. I attached bios modded with mmtool4 only. You can find the needed download links and a short guide about how to use the BMP tool within the start post of >this< thread (look into the chapter "Update of the intel VGA ROM/EFI GopDriver modules"). Hi sorry for replying so late but I didn't have time to made any mod. So, my modde bios is attached, you can look at it and check if I didn't made any mess in it. I update microcode for IVY using cpu patch in mmtool4. Then i exctracted vga rom using mmtool4 and then i used bmp tool to transfer settings step by step. I downloaded vbios and bsf files from this forum and i used mobile versions of course.